Last week I gave a sneak peak of our Halloween costumes, did anyone guess our costumes? 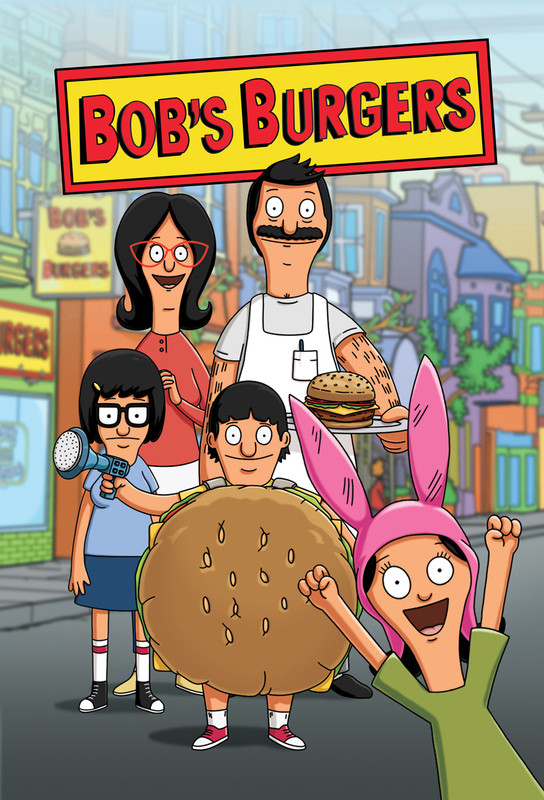 BOB’S BURGERS!!! And here’s our finished costumes…..
My husband and I went as Gene and Louise Belcher and our friend, Andrew, went as Bob! I gotta say, I really thought this year would be different. I really truly believed that I would get an early start on our costumes. I even started shopping early. But somehow, I still found myself making our entire costumes in the 2 days before Halloween. Bob. Andrew went as Bob and, fortunately for us, he had worked as a cook and was able to dig some nice greasy cook’s pants and an apron out of his garage. I went out and bought him a wig and a mustache to complete the look. Unfortunately, the mustache was so cheap all the glue stuck to the paper backing instead of the mustache so we weren’t able to stick it to his face. I’m sure there was a solution but we’d dipped into the whiskey at this point and quickly lost interest. Gene. My husband dressed as Gene and I think his is my favorite of the three. I purchased the wig at a Halloween store, the yellow t-shirt at Goodwill and Pete already had the blue shorts. 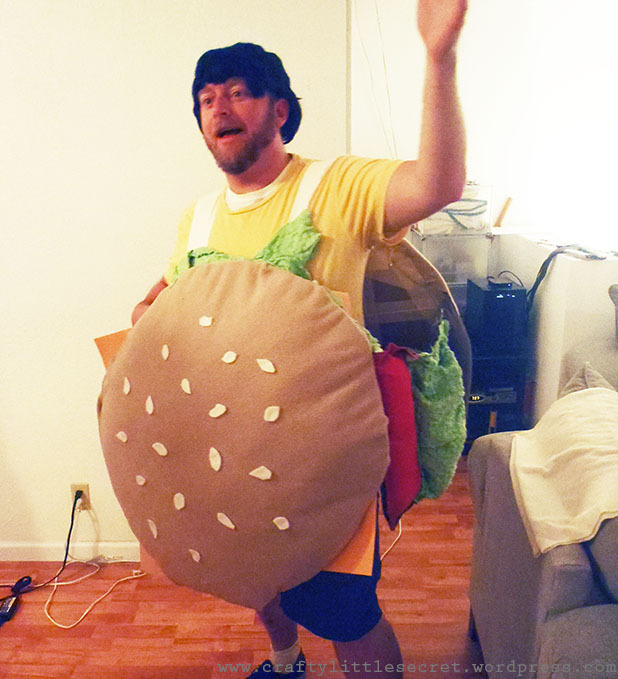 Andrew and I actually made the hamburger costume the afternoon leading up to Halloween night. I love how it turned out but in retrospect there were some things I could have done to make the construction easier. Another Halloween habit of mine is having too much fun to take pictures! So, the rest of the pictures were taken the next day in better lighting. 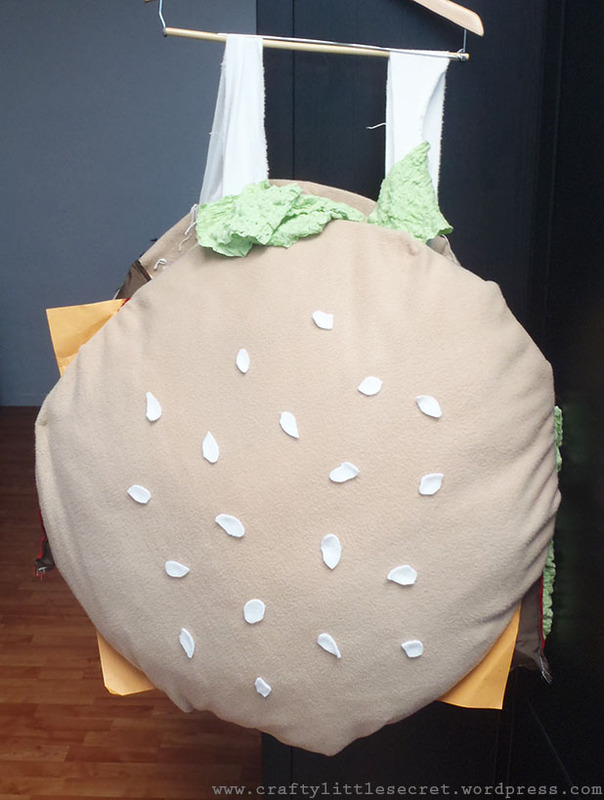 The hamburger is made out of a mixture of scrap fabric, cardboard, fleece, recycled bits and notions I already owned (ASIDE: I absolutely love having enough of a craft cupboard that I can go to my stash to solve sewing dilemmas instead of the store). We cut two large circles from cardboard to form the structure of the bun, then cut two slightly larger circles out of the tan fleece fabric. I spray glued Fiber Fill to the top of the cardboard, then laid the fleece over top and spray glued the fleece edges down onto the cardboard. All the edges were reinforced with some heavy duty tape. My fabric glue of choice is Pro Stick 25 Textile Adhesive Spray. 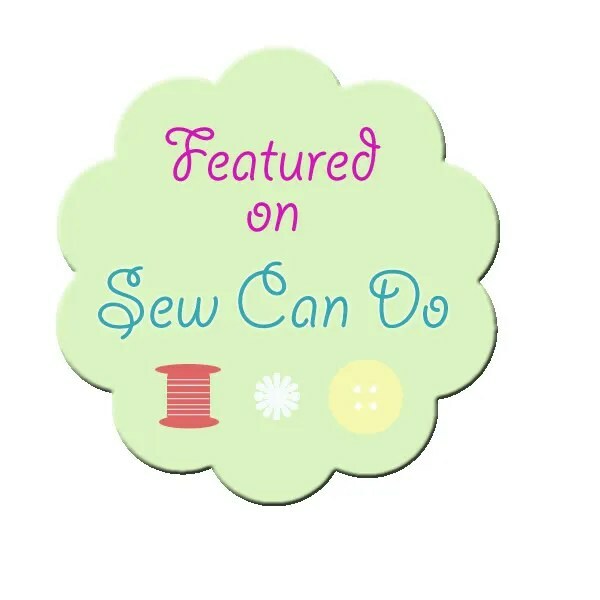 I bought mine from my local fabric store and it is amazing stuff. This is the second year in a row that my husband’s Halloween costume was held together with nothing but fabric glue and tape and it actually held up the whole night!!! This is one thing I wish I had thought out a little better. 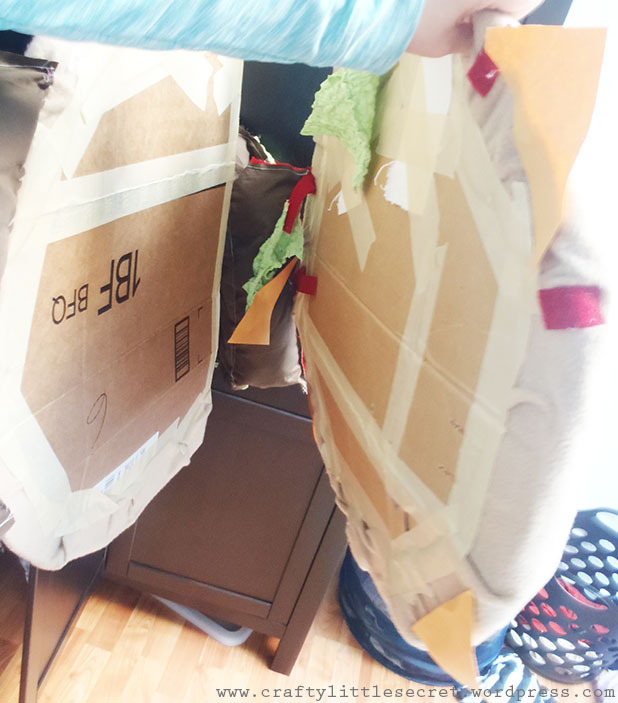 By gluing the fleece to the cardboard and forming the buns as a first step, I forced myself into a lot of hand-sewing and spray gluing in future steps when attaching all the bits and pieces. 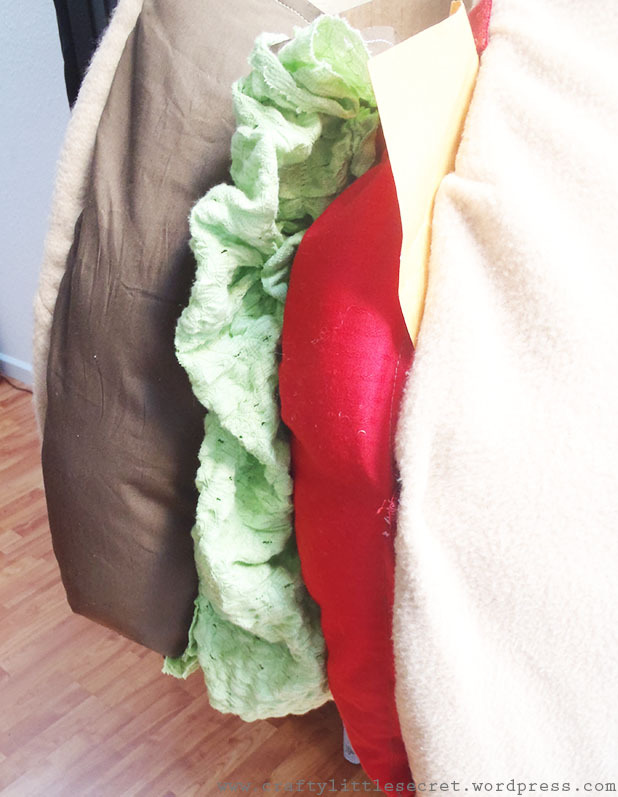 The sesame seeds were cut from fleece leftover from my Max costume that I wore for last year’s Halloween and glued in place with fabric glue. 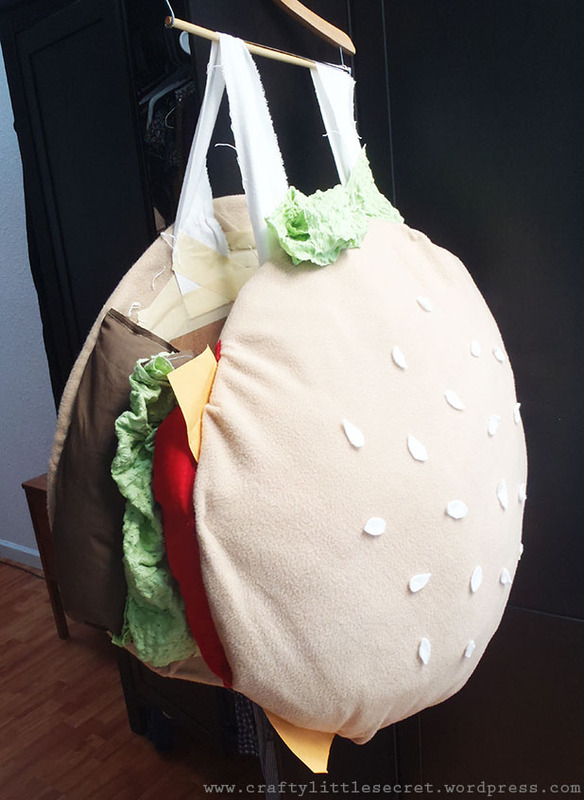 Isn’t the green fabric I found just perfect for lettuce???? The hamburger patty and toppings were a stroke of genius that I wish I could claim credit for, but it was actually our friend Andrew’s idea. 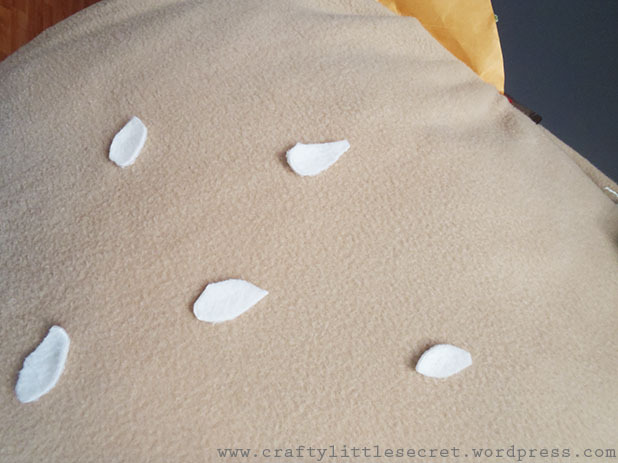 I sewed each side panel as a large pillow where each topping was a different pocket. We filled the patty and the tomato with Fiber Fill but filled the lettuce with scrunched up pipe cleaners to give it a floppier appearance with a bit of structure. Once both side panels were done I hand stitched them to the back bun, then stitched on some velcro I had in my stash to attach it to the front bun. I did this so that Pete wouldn’t feel too constricted in the suit, but I didn’t like that it made the whole thing feel a little flimsier. He liked that it was able to undo the suit though as it helped him when he was trying to sit down! – Cheese: Cut up manila envelopes!!! 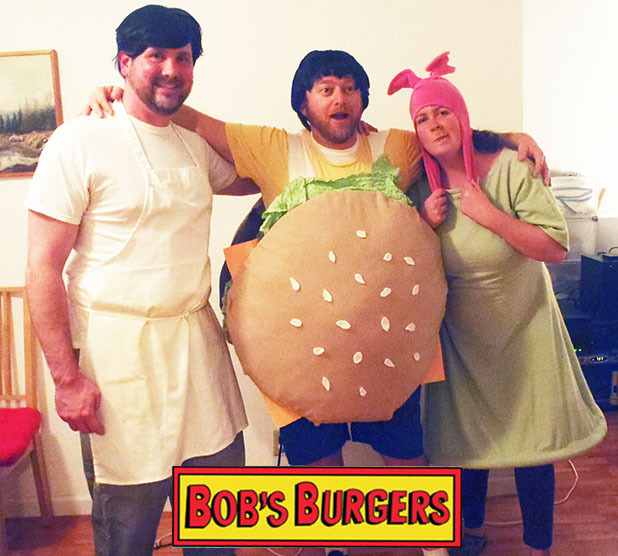 The entire Gene Belcher costume cost us $30.54 (and a full half of that amount was the cost of the newly purchased wig!). Which brings me to another point – the remnant bins at fabric stores are great places to find great deals, especially for something as (potentially) single use as a Halloween costume. Louise. 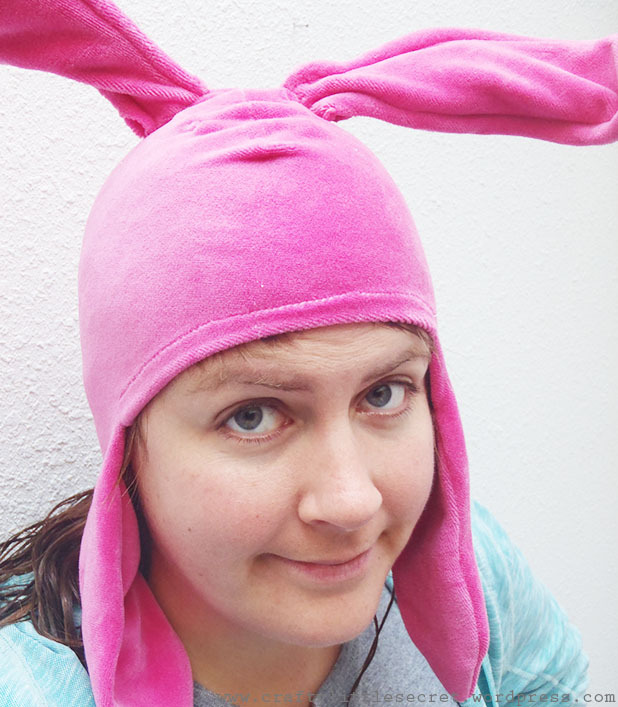 I made my Louise costume using items I found at Goodwill. Her signature bunny ear hat was made from a hot pink velour shirt and the dress was made from a giant duvet cover that I got for a steal ($4.50 and I didn’t even use half the fabric!!!! 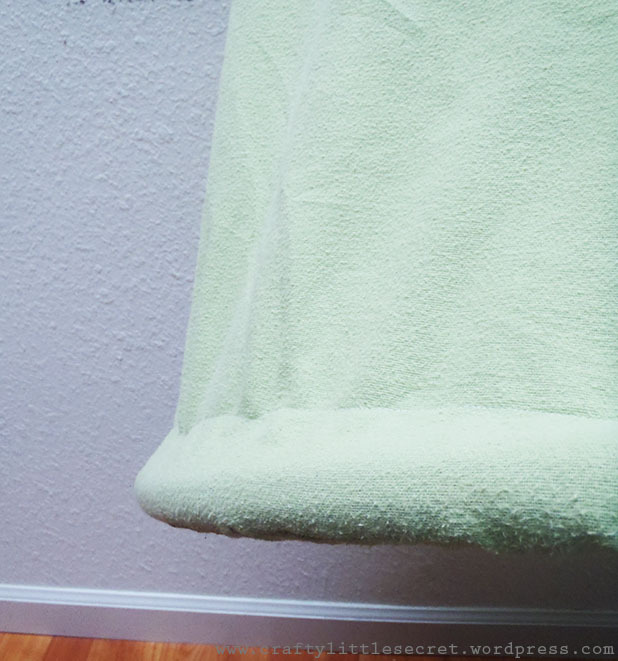 The remaining piece might make a great cozy quilt backing…). I very roughly based the dress off a blouse pattern that I had. Very roughly. I basically just traced the neckline and darts, then made up the sleeves (I was definitely not going to be bothered to set sleeves for a Halloween costume!) and added the length. 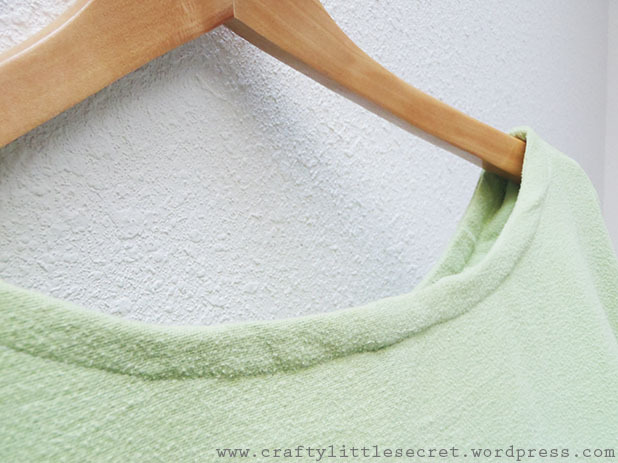 I made a quick facing for the neckline and top-stitched it down to keep it in place. I was in such a rush I didn’t even change my thread color to co-ordinate! Whoops! 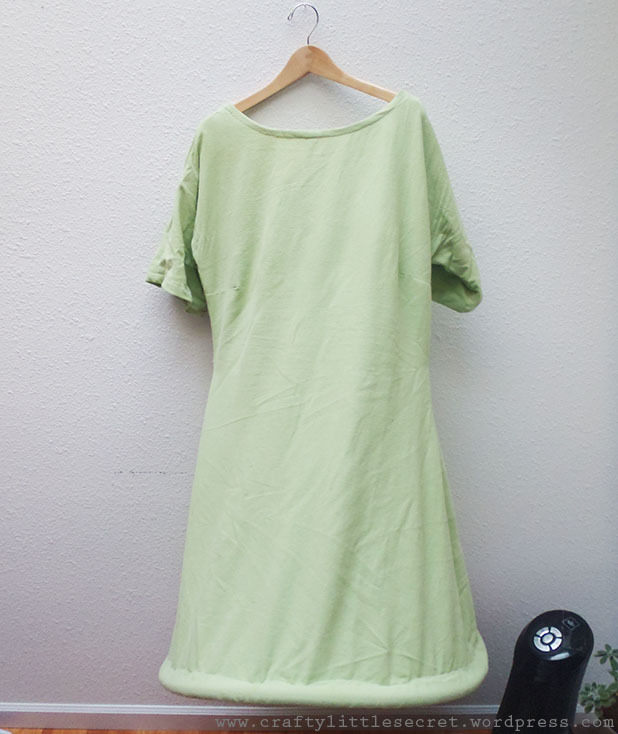 You may notice the bottom of the dress keeps its own shape and sticks out. This was Andrew’s second brilliant idea of the afternoon……I sewed an old busted bicycle tire into the hem of the skirt to give it that cartoon kinda look! More recycling!! I really didn’t want to spend the time inserting a zipper in to this costume but the thing was fitting my like a sack! I took in the waist as much as I could but since the fabric didn’t have any stretch I couldn’t take it in much before it wouldn’t fit over my shoulders anymore. Instead, I just inserted a little elastic panel to the waistline back to snug it in a little more at the waist. The hat ended up being surprisingly easy to make. 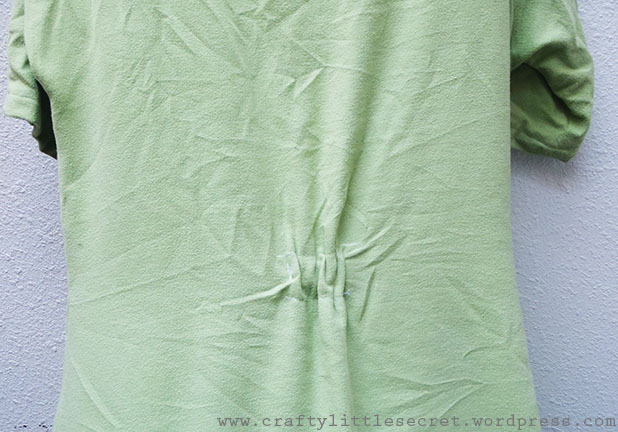 The shirt I used originally had pink sequins sewn to the front of it so before I got started I cut them all off and saved them in my notions stash. Waste-not want-not! 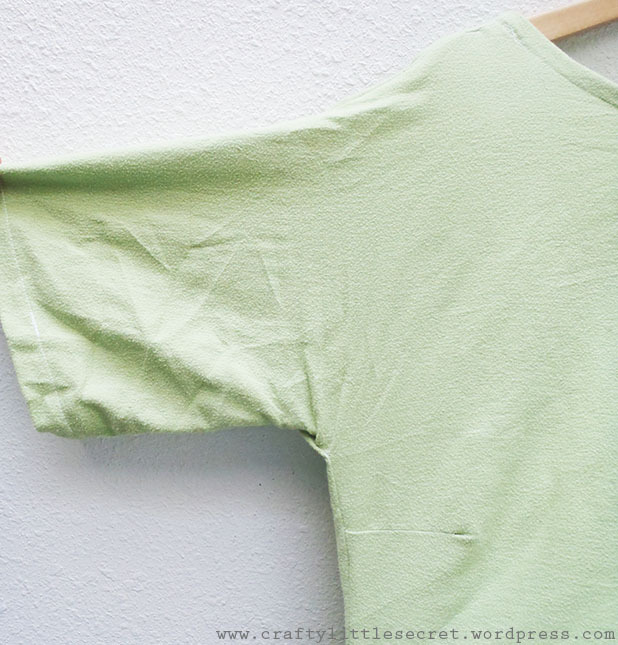 Every time I throw out unsalvageable clothes I always look to see what can be saved – buttons from men’s dress shirts, hooks and eyes from bras – it’s all great stuff for the stash! I used a toque I already owned to trace a rough shape that would fit my head then added the ear flaps when I cut it out. I only lined the ear flaps and just turned up the front for a hem. The bunny ears themselves were a bit trickier but not too bad. 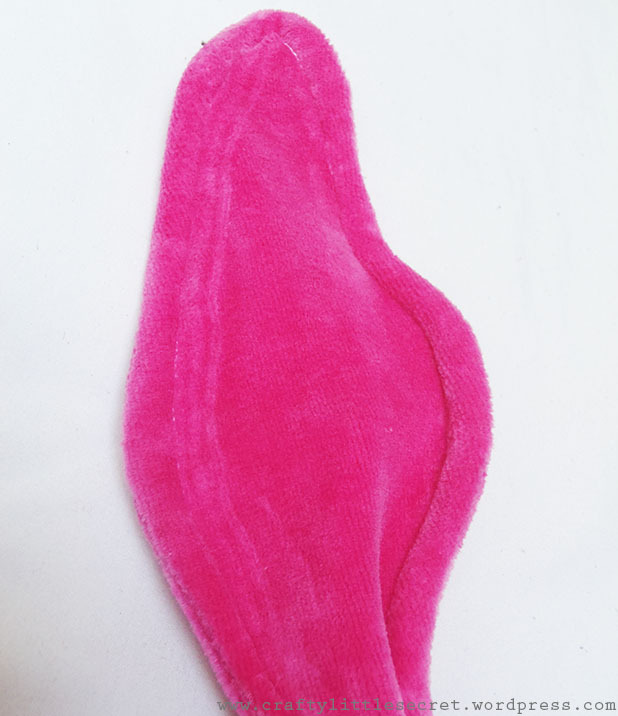 I sewed the outer edge of the ears then inserted pipe cleaners and pressed them against that outer edge. I then sewed on the inside edge of the pipe cleaner, effectively encasing them in the bunny ears. Careful though, if you nick the metal part of the pipe cleaner that’s a good way to break you needle and send the shards flying….not that I speak from experience or anything…. The tough part was getting the ears to stand upright, and I don’t think I totally succeeded with that (maybe I would have tried some more options if I’d left myself more time). I positioned the bunny ears while wearing the hat then sewed them on. Once they were secured I cut a small hole up through the bottom of the hat and into the center of the ears. I folded a pipe cleaner in half and inserted the folded end up through the hole, leaving a couple inches of the ends exposed. I bent those ends in opposite directions, one going toward the front of the hat and one going toward the back, then hand stitched them in place. And that’s it! Done! 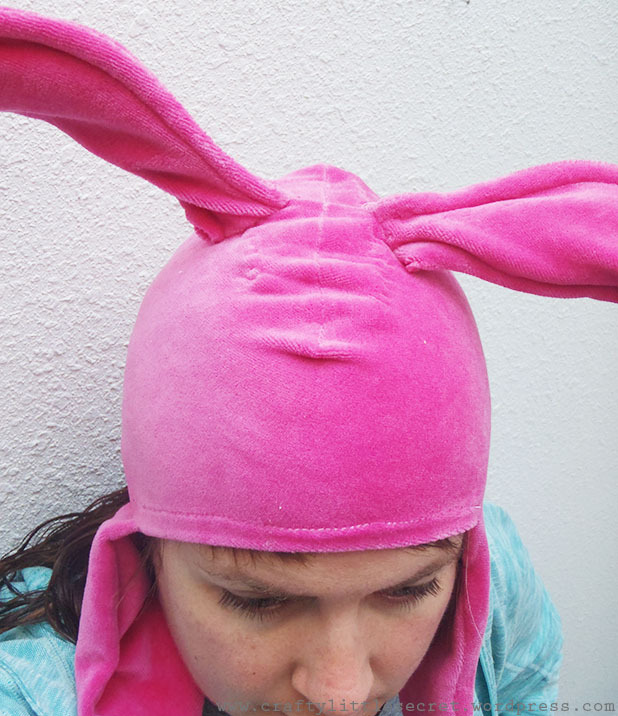 The entire Louise Belcher costume cost me a measly $9.98 (with yards of fabric still left) and used only refashioned fabrics from Goodwill and notions from my stash! It was a green Halloween!! Now for the hard part…..finding a place to store all these costumes!! This entry was posted in Uncategorized on November 1, 2013 by missphd. How fun. I love the hamburger boy. You are amazing.